The silver tones of the case and bezel look indescribably cool next to the purple dial. The date is in the 4 position, in a little circle-shaped window. The silver toned hands and hour markers against the purple make it easy to read the time - even in low light (they're luminous). 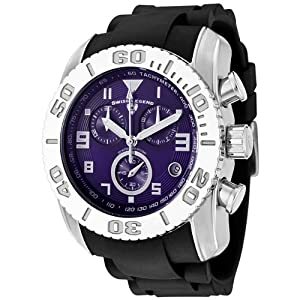 The tough black rubber strap is durable and sturdy, and the perfect complement to the silver and purple colors. Not to brag, but it's also got a reliable Swiss quartz movement, stopwatch functions, and a water resistance rating of 660 feet (200 meters). With that rating and its unidirectional rotating bezel, it's designed to be a dive watch. But he doesn't have to be a diver to appreciate this very cool watch. Click for more information.